A product of New Orleans, LA, Thomas was named All-State, All-Metro, and All-District 10-4A. 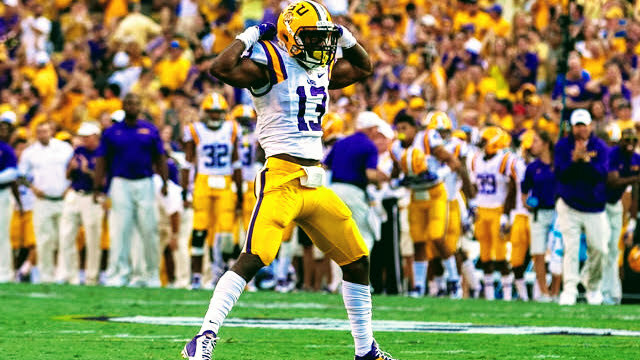 He was ranked as the #14 cornerback in the nation by Rivals.com and 247sports. He committed to play college ball at LSU. Thomas enjoyed a solid career as a Tiger, splitting time between corner, nickelback, and safety. He played in 29 games, accumulated 68 tackles, 9.5 tackles for losses, 12 pass breakups, 4.5 sacks, 2 forced fumbles, and 1 interception. He finest season came in 2016 when he corded 42 tackles, 7 tackles for a loss, 1 sack and 1 interception. Thomas developed a reputation as a strong blitzer and run stopper from the slot and actually finished tied for second on LSU’s squad with 5 quarterback hurries. Undrafted in 2016, the 6’0″, 195lbs Thomas signed on with the New England Patriots. In 2018, he will look to keep his NFL dreams alive by playing in The Spring League.